Central vacuum hoses have come a long way. They are now lighter, more durable, and provide better suction. Inside, they are wider and smoother so the vacuum works better and debris flows through faster. We pride ourselves in offering the high quality, North American manufactured, electric hose, and we guarantee you will appreciate how it feels and functions. For information regarding Hide-a-Hose, the retractable hose system, visit our Inlets page! Homes with carpet can be cleaned with an electric powered beater brush which requires 120 volts. The hose to operate this can either have a short pigtail electric cord that plugs into a nearby electrical outlet or can be inserted into electrified inlets that have two pins that slide into holes as the hose is inserted into the valve. Homes with mostly hard floors can save money without compromising quality by using the Low Voltage Hose. It also makes an excellent upgrade for most systems that start when the hose is inserted into the wall valve. 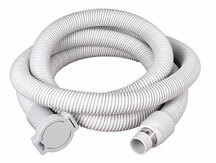 The Basic Central Vacuum Hose is a tremendous value, delivering more suction, and making your home cleaner than ever. Replace any simple basic hose with the new Basic Hose and gain the upper hand in your chores. The amazing Stretch Hose for quick clean-ups is only 7-FEET LONG BUT STRETCHES TO NEARLY 30-FEET. It is a perfect way to utilize your existing system for quick clean-ups without getting the long central vacuum hose out! Excellent for the mudroom, kitchen, bathroom, laundry room, entries, pet hair and litter, spills, and pests and bugs. Stretches from 7 feet to 30 feet! Is your hose too short? The Extension Hose saves you time by giving 12 feet more of cleaning distance. 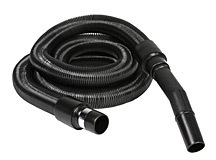 Extend a 30-foot central vacuum hose to 42 feet! You can leave it plugged in and it will not lose any suction. 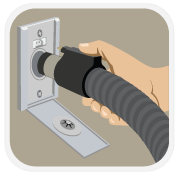 Simply plug the Extension Hose into your wall inlet and your hose into the Extension Hose. Compatible with all hoses EXCEPT two-pin electric hoses. 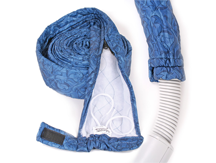 The Zipper Padded Hose Sock is fully padded, washable, and easy to install, the beautiful blue or gray Zippered Hose Sock Cover fits on all central vacuum hoses. It's like a soft sleeping bag for your central vacuum hose. 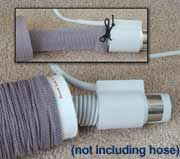 The Original Hose Sock permanently installs on the hose and is form fitting. It comes with an installation tube to bunch the hose sock on before pulling the hose through it to let the sock on to the hose. Compared to the Padded Zippered Hose Sock it is less smooth and unwashable but less bulky. © 2019 M.D. Manufacturing, Inc. Usage rights are only for current M.D. Central Vacuum Dealers.